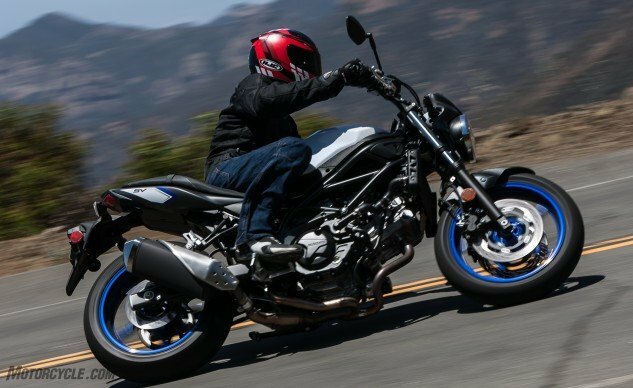 If you’ve read my 2017 Suzuki SV650 First Ride Review, you’ll know how I feel about the new SV. 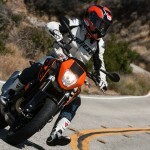 I’m a big fan of the new bike and feel that it’s recaptured the magic of the original SV. 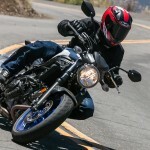 With its charismatic and refined 645cc V-Twin, I was instantly drawn to its fun-loving character, and now that Suzuki has wised up and given the bike an attractive – and competitive – $6,999 price tag, it’s clear Suzuki is answering the challenge thrown down from its crosstown rival, Yamaha, and the $6,990 FZ-07. 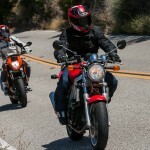 The two have a lot of similarities, with nearly identical price tags, twin-cylinder engines with similar displacements, and minimal bodywork. So naturally, it made sense to pit them against each other. 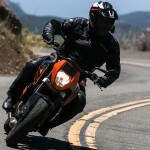 However, as we were plotting the course for this test, another motorcycle came up on our radar screen: KTM’s 690 Duke. 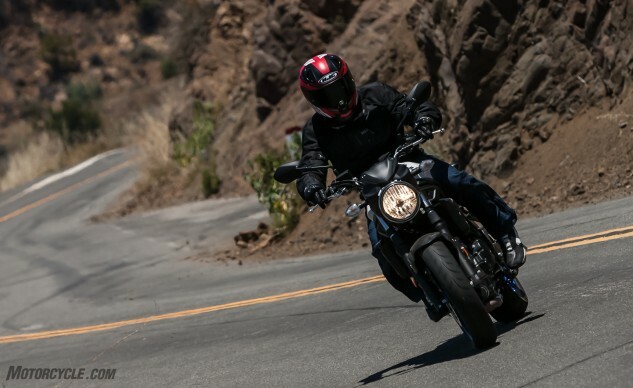 At $8,999, it costs a fair bit more than the Japanese bikes here, and its single-cylinder engine is only half the cylinders of the others, but it, too, can be classified as a naked middleweight so we decided to throw it in the mix. 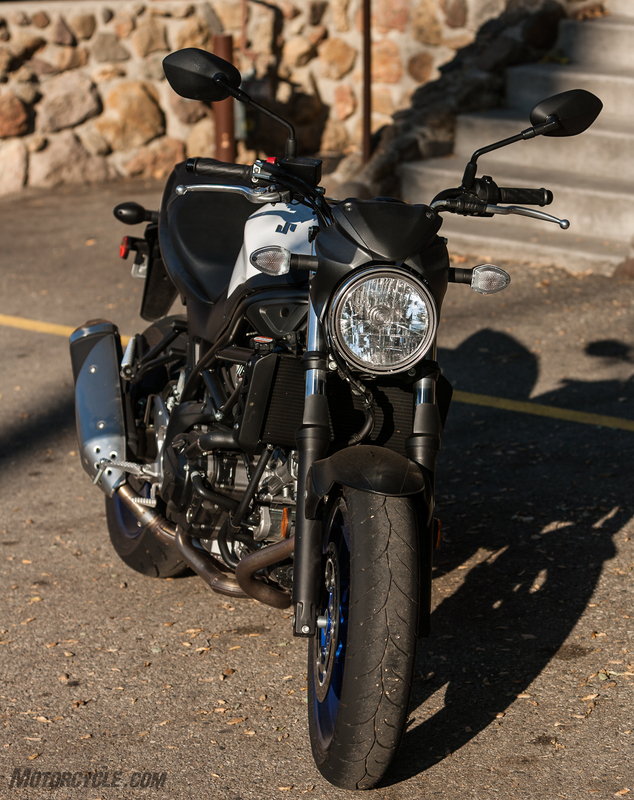 And for nostalgia’s sake, former MO staffer and current MO contributor, Gabe Ets-Hokin, was gracious enough to bring his 1999 Suzuki SV650 along for the ride to see how much progress the category has really achieved in the past 17 years. 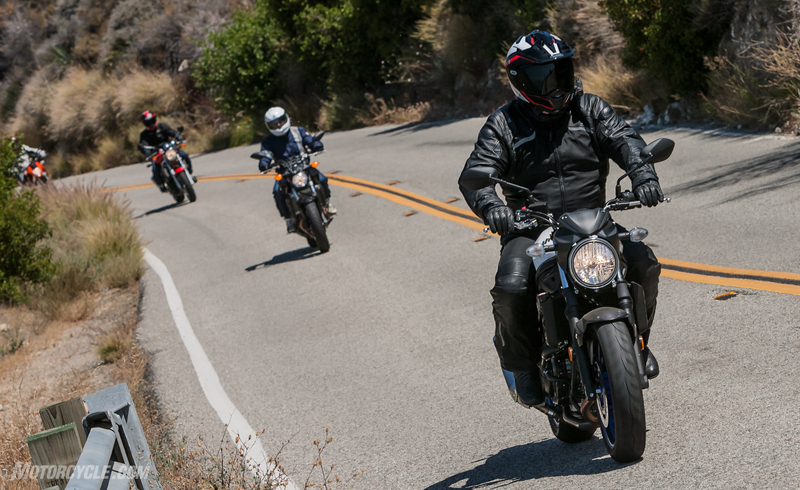 Joining myself and Gabe was MO’s Editorial Director and former SV650 racer, Sean Alexander, and everyone’s lovable curmudgeon, John Burns. Three of us are unabashed SV sympathizers. 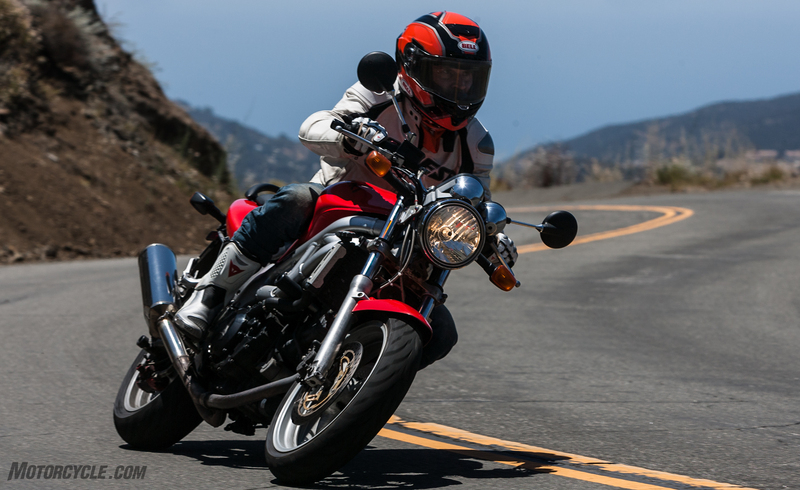 Meanwhile, we tricked John into coming by telling him we’d have a Honda NC700X along for the ride. He really does love that thing. Sucker. Motorcycles like the SV and the FZ live and die by their engines. 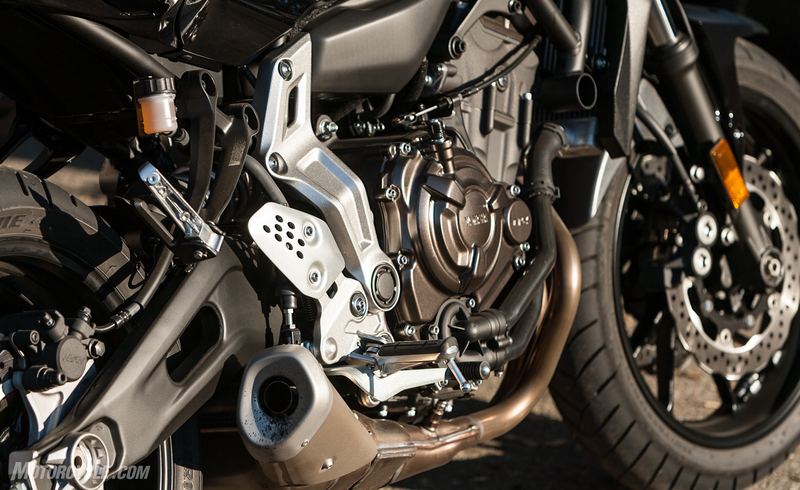 The bikes’ low price points are achieved through the use of bottom-bin parts, so manufacturers can focus most of its resources (read: money) on engine development. 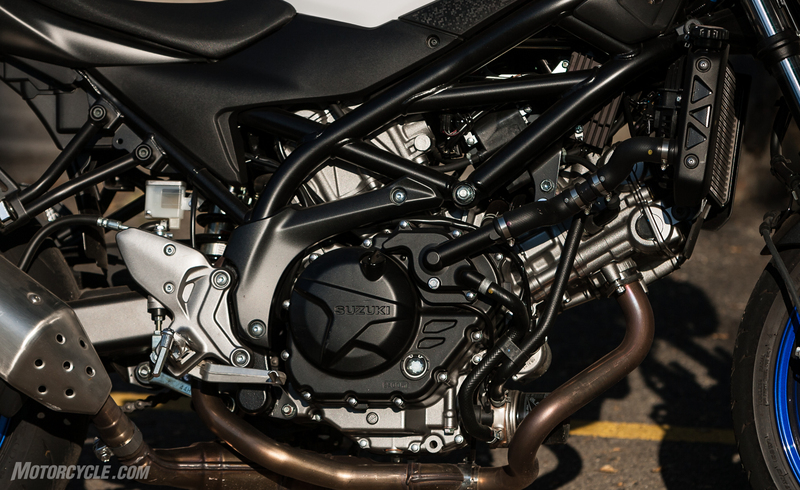 Because, in the end, an exciting engine will make up for many shortcomings in other places. Especially if the price is attractive. 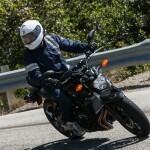 The SV and FZ are examples of what happens when a manufacturer gets this formula right. 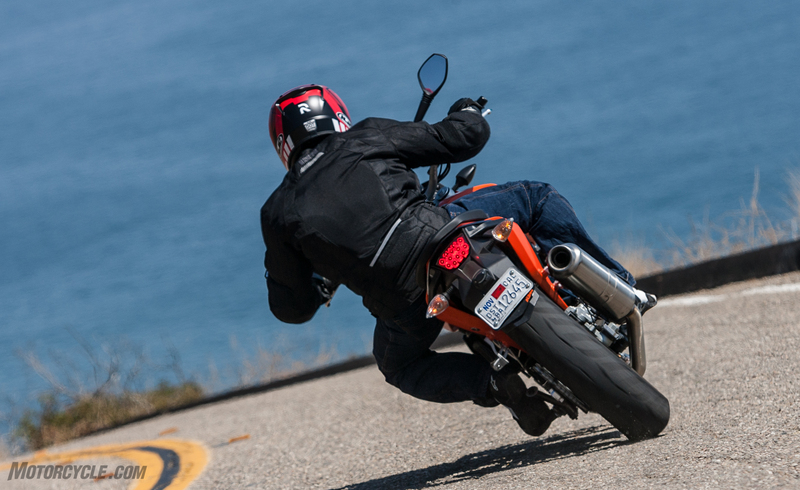 The three modern bikes are so close you could also call this test the 70-horsepower shootout. All three are separated by exactly one horsepower, but looking at the graph you can see the Yamaha edges both the KTM and Suzuki at nearly every point on the graph. 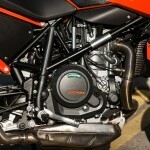 The SV really needs to rev before it can compete with the others. 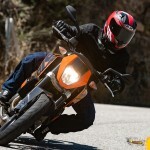 The KTM really comes alive in the mid-range. 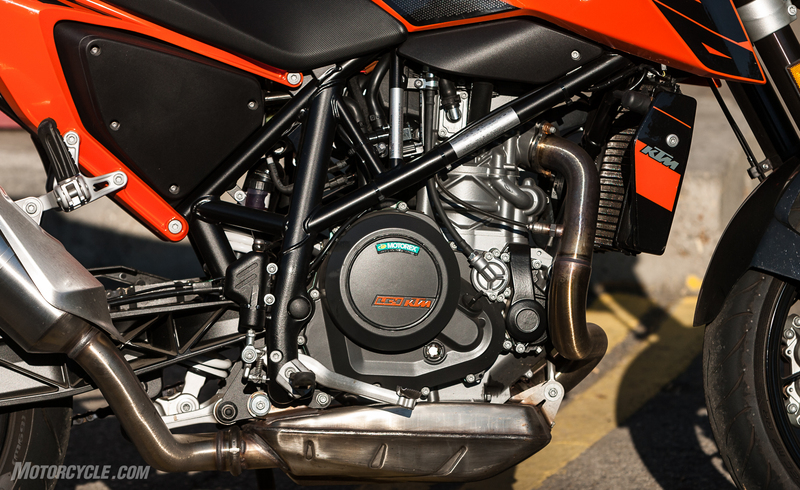 Dyno operator Chris Redpath of MotoGPWerks says a loose chain is at least partially to blame for the spikes and dips in the KTM’s curve. 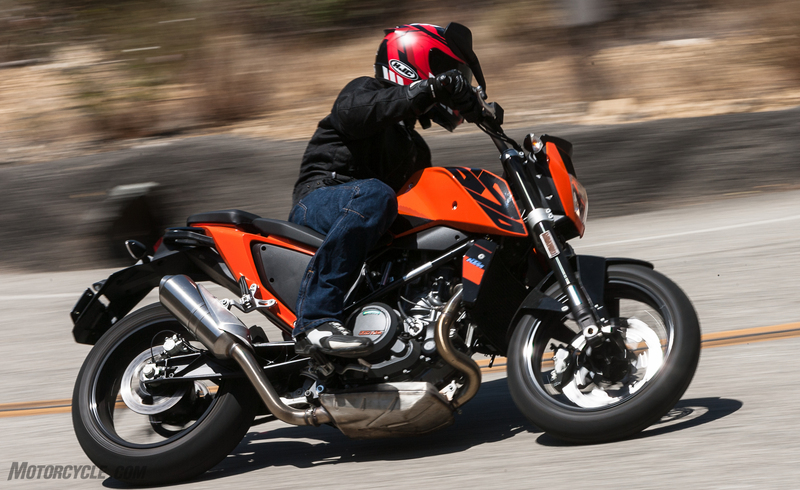 If you remember from the SV video, I mentioned how the SV pumped out 72.8 hp and 46.0 lb-ft of torque. 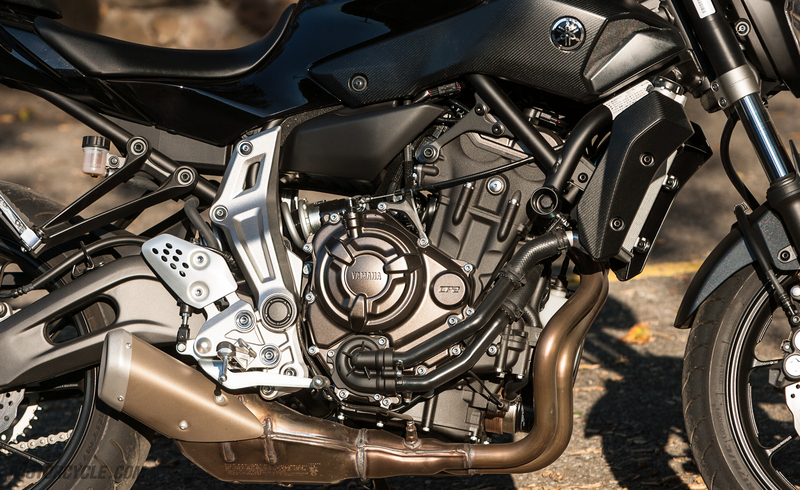 The Yamaha and KTM weren’t available yet at the time of that run, so in the interest of fairness we ran all three bikes together on the MotoGPWerks dyno, where the new SV spun the drum a second time to 70.8 hp and 44.9 lb-ft. 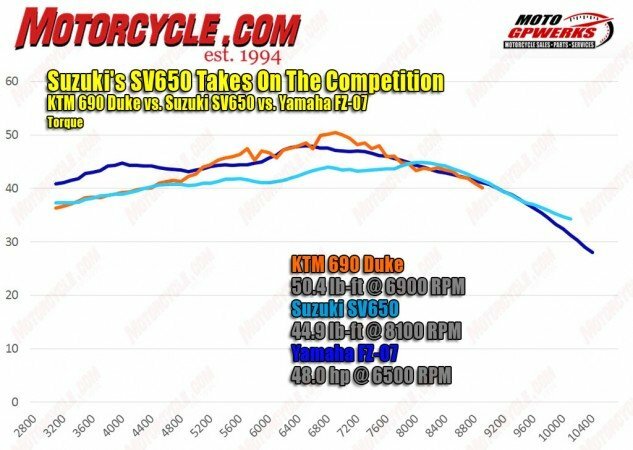 While it was a little disappointing to see the minor drop in power, it goes to show how much dyno runs of the exact same bike on the exact same dyno can vary on different days and different times of day. 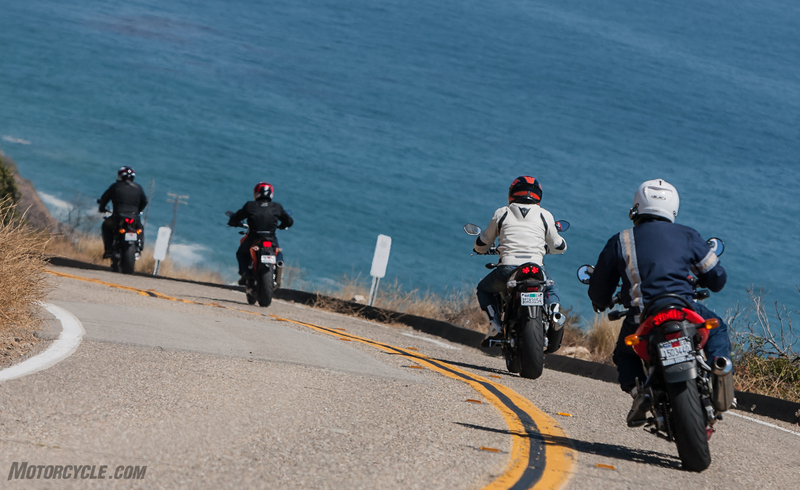 What was impressive, though, was the separation of all three bikes. 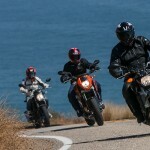 Both the KTM and Yamaha made 69.8 hp at their peaks, resulting in a separation between the three bikes of exactly 1.0 horsepower. 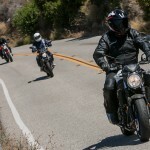 All three bikes made peak power between 8500 rpm and 9000 rpm, to boot. 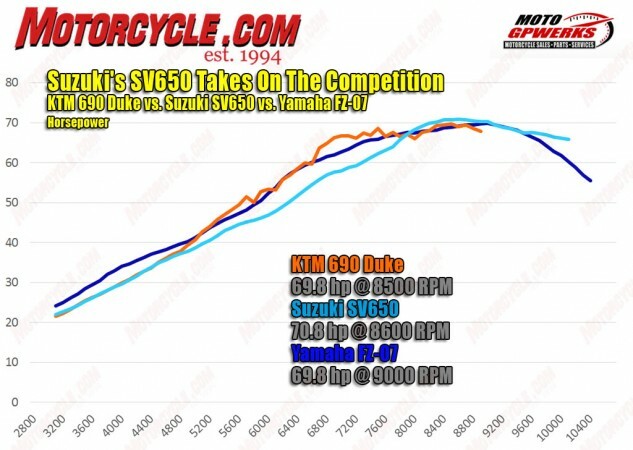 In the torque department, however, the SV falls behind, as it has the least displacement; the Yamaha made 48.0 lb-ft and the KTM 50.4 lb-ft. Making matters worse for the SV is the fact its peak torque is produced at 8100 rpm, while the KTM only needs 6900 rpm to reach its peak, and the Yamaha 6500 rpm. 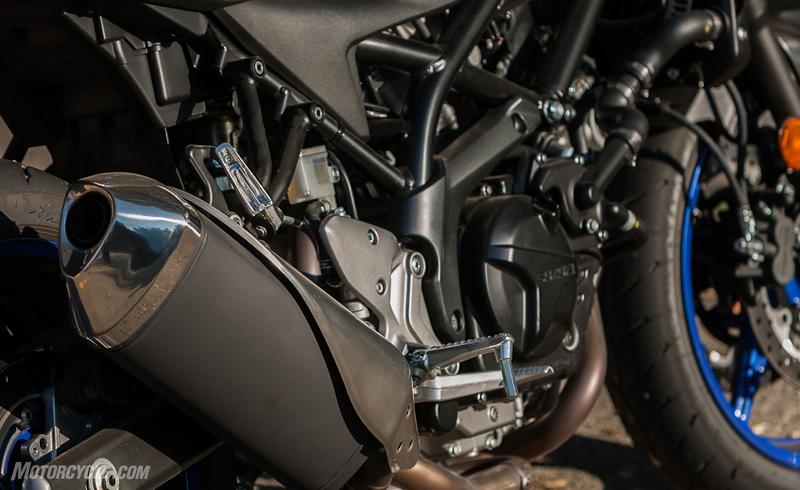 Gabe’s old SV never made it to the MotoGPWerks dyno, but it’s no matter since his bike may look stock on the outside, but features a number of modifications, including a jet kit for the carburetors(!) and a camshaft upgrade from the second-gen SV. Gabe estimates his bike makes somewhere in the ballpark of 68 hp. 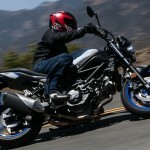 Once again, the Suzuki, with the smallest displacement here, comes up short on the torque front. The peak numbers might be close between all three, but look how much the SV suffers below its 8100 rpm peak. 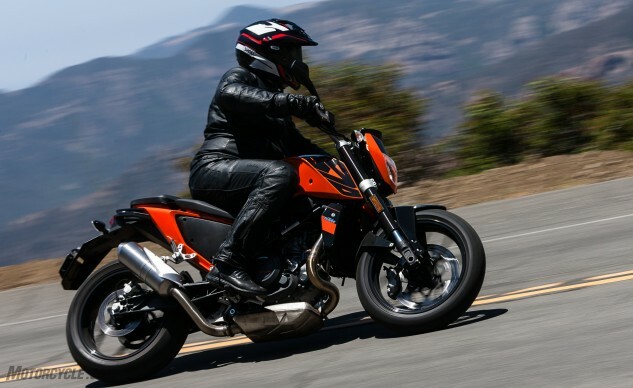 Again, the SV really has to spin to make its power. 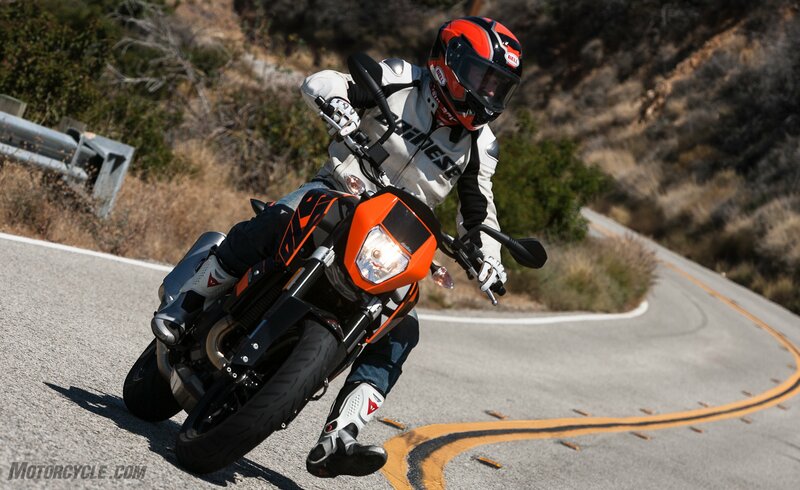 But then you hop on the KTM and remember that there’s no replacement for displacement. 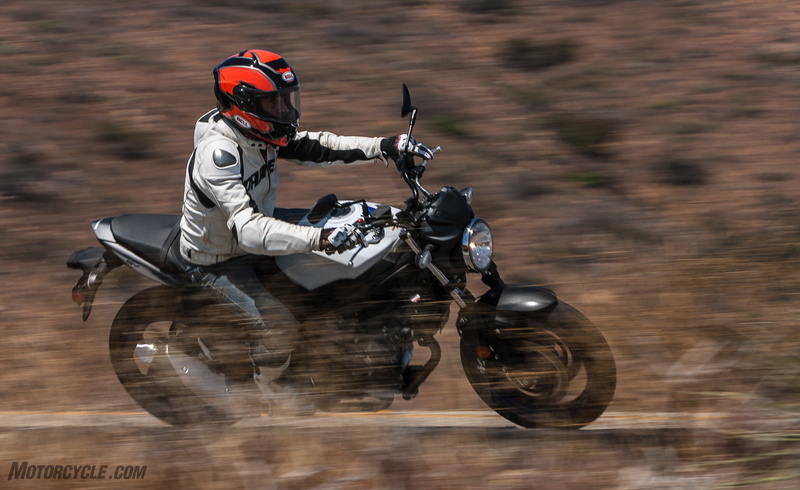 The 690cc Thumper makes more torque than the SV, only one less horse, and crucially, it weighs a massive 85 lbs less than the Suzuki. 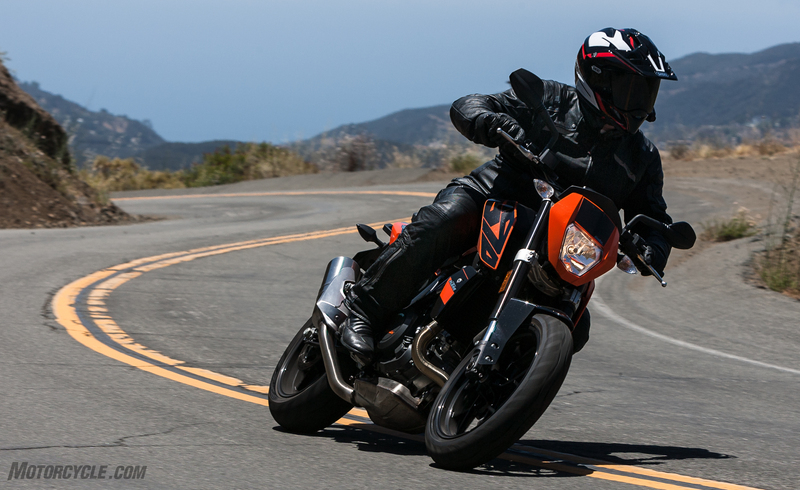 The KTM basically sheds the weight of a prepubescent teen compared to the SV, and thusly feels more powerful than the new Suzuki. “This is a Single that feels like a Twin,” says Gabe. 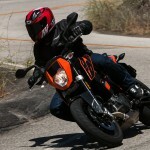 “It’s very nice down low and really fun when it gets to the top of its rev range.” Gabe also liked the KTM’s midrange. KTM’s 690cc Single powering the 690 Duke is mighty impressive for a Thumper. 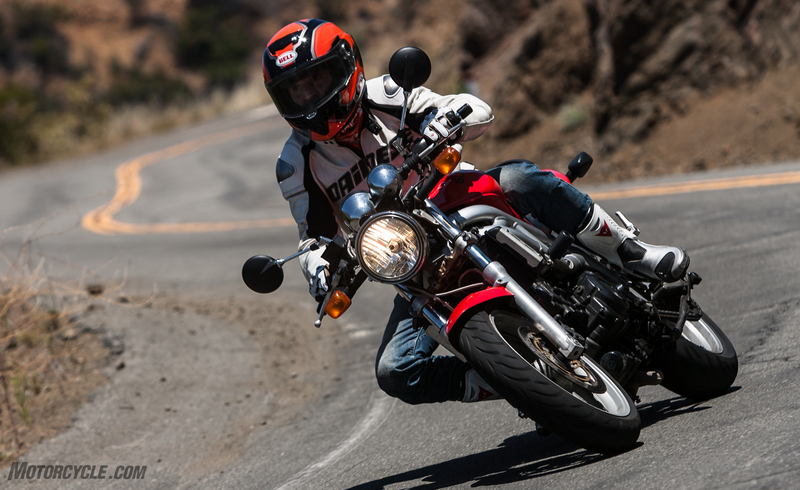 It’s quick to rev and makes the most torque here. 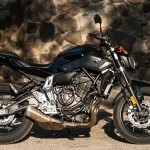 The Yamaha, too, has a weight and cubic-centimeter advantage over the SV. 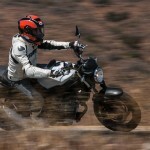 It’s not 85 lbs lighter like the KTM, but a 33-lb deficit is nothing to sneeze at. 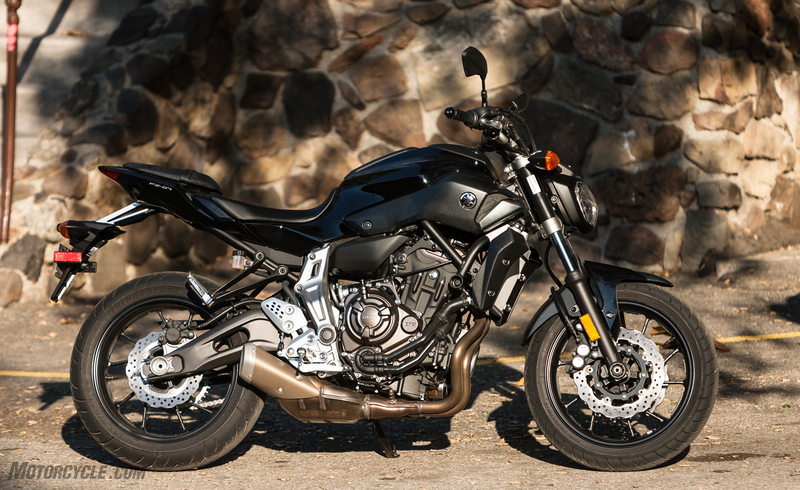 Couple that with significantly more torque than the SV below 5000 rpm (and more horsepower below 8000 rpm), and the 689cc FZ-07 leaves the 690 Duke and both SVs behind once it’s time to get moving. 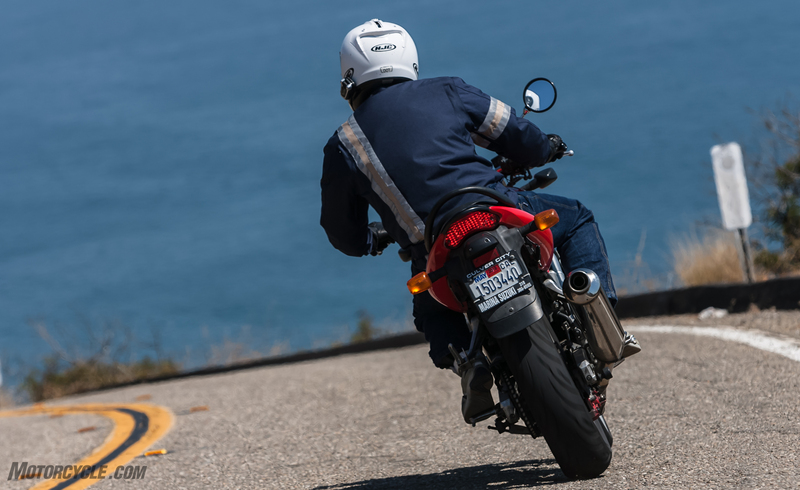 “Compared to the Duke and SVs, the FZ accelerates my large load with noticeably more urgency out of low-speed corners,” notes Sean “I Heart Pork” Alexander. 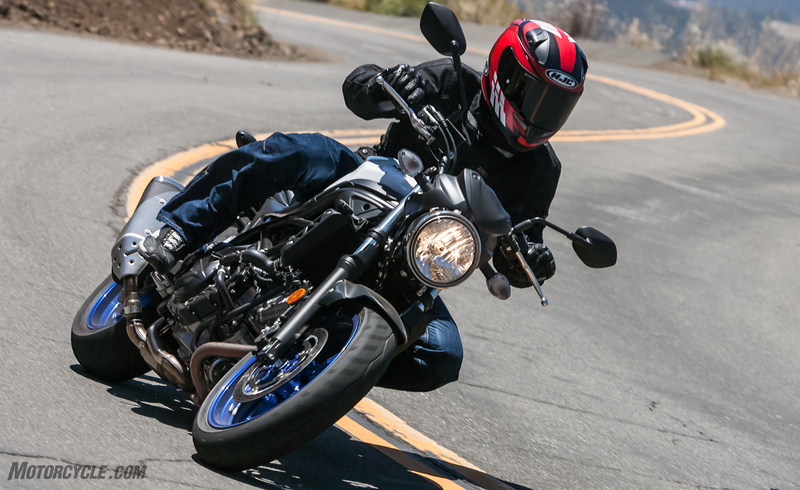 “It simply has a better spread of torque for street use.” The parallel-Twin, and its 270-degree crank, sounds great but “it’s extremely quiet,” says Sean. 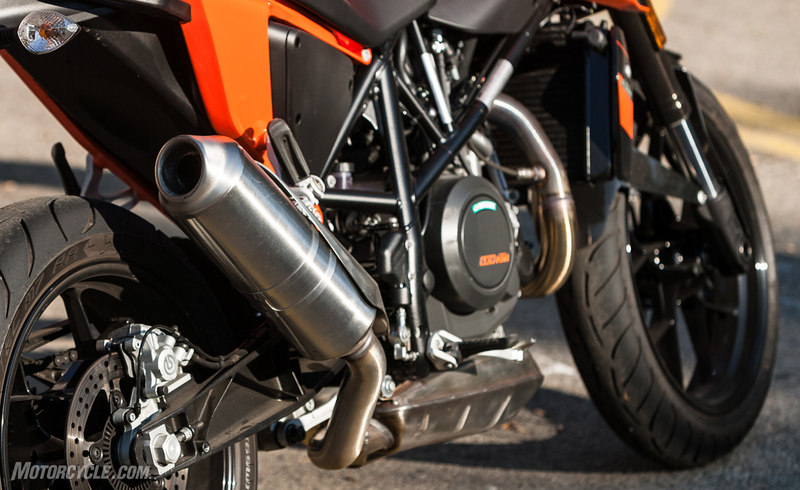 “It could really use an aftermarket – or stock Aprilia – silencer.” Zing! 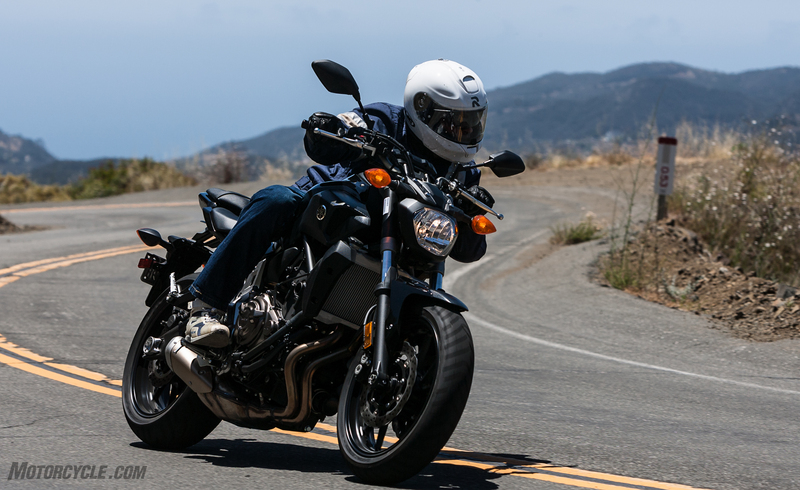 It’s rare to complain about a motorcycle being too refined, but that’s exactly what Sean has done, calling the FZ-07’s throttle response too soft. Are you likely to notice? Probably not. The rest of us didn’t. It’s fine. Move on. 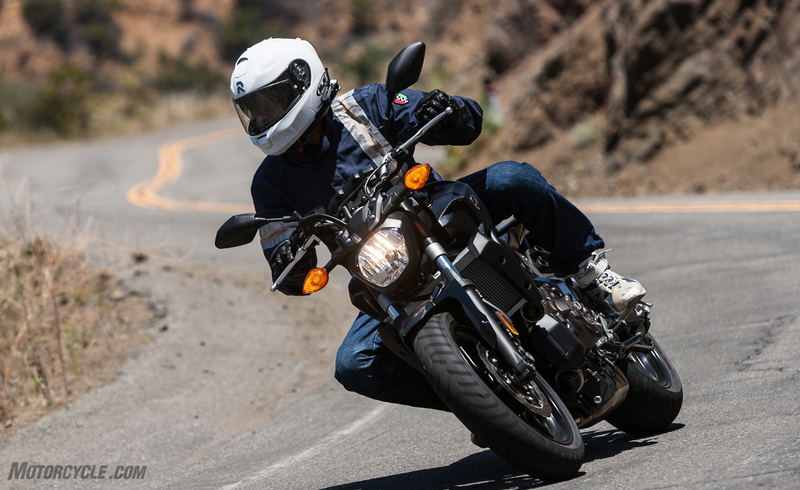 That said, it should come as no surprise that the FZ-07’s inline-Twin won unanimously among the four testers on the MO Scorecard, its 93.1% rating besting the KTM’s 87.5% score. 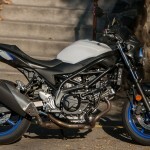 The new SV tallied 86.3%, and the old SV 84.4%. In the handling department light should make right, right? It should, but our testers are all over the board here. 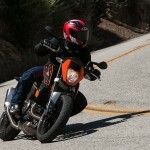 Indeed, at 345 lbs and the lightest bike in this test, the KTM was easy to flick around. 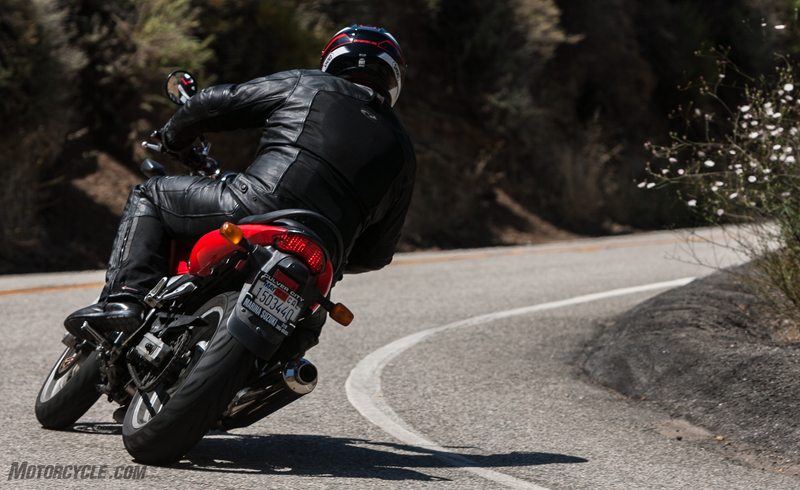 The leverage provided by the wide bars helps to throw the bike wherever it’s needed. 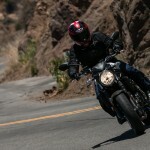 The suspension was firm and taut, at least according to Gabe and Yours Truly. 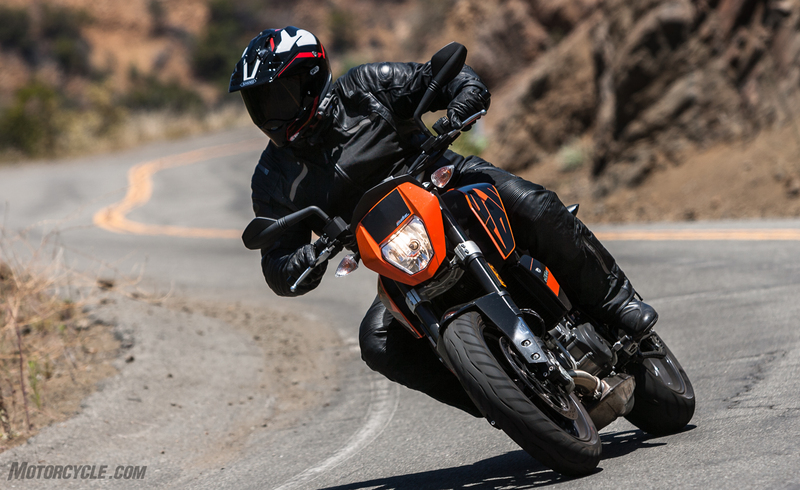 In fact, the combination of the bars, suspension, and weight made the 690 Duke my favorite in the handling category of the scorecard. 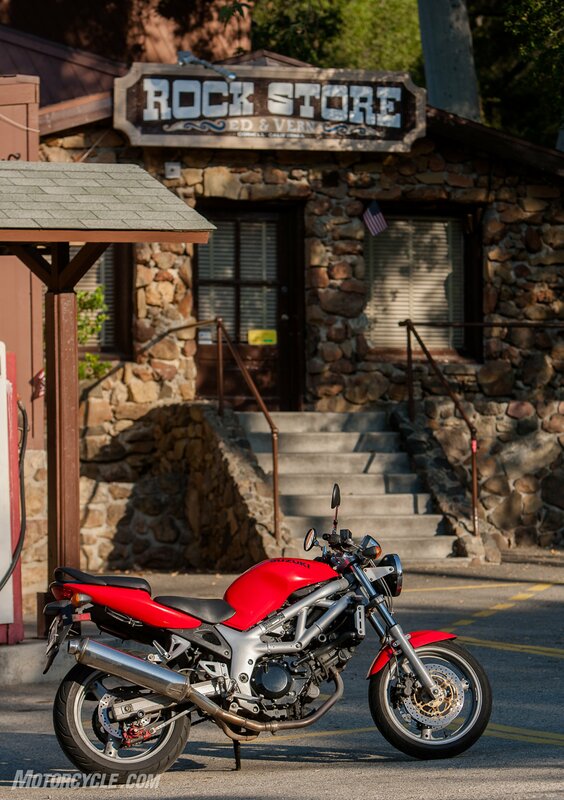 Hey, there’s a first-gen SV, complete with its distinctive aluminum trellis frame! The old girl did well and still looks good after all these years. At least from afar. 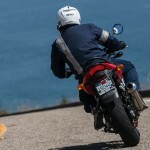 Oddly, Sean called the suspenders too stiff, while JB wasn’t a fan of the amount of dive on the brakes and squat on acceleration, never truly feeling comfortable with the Duke. 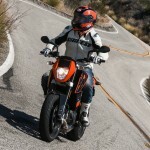 Then again, SA and JB were spoiled by the accessorized 690 Duke we flogged two years ago in our Middleweight Mashup Shootout. 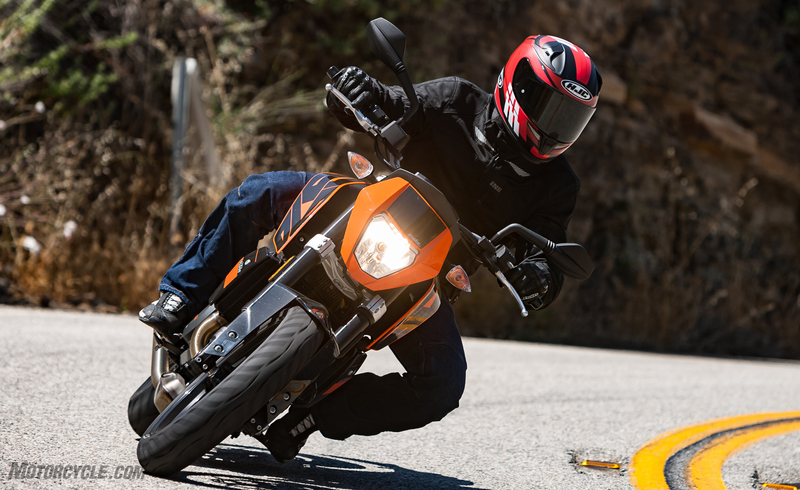 Nonetheless, despite lowering their expectations for this non-accessorized new 690, neither of these two were big fans of the KTM’s handling. 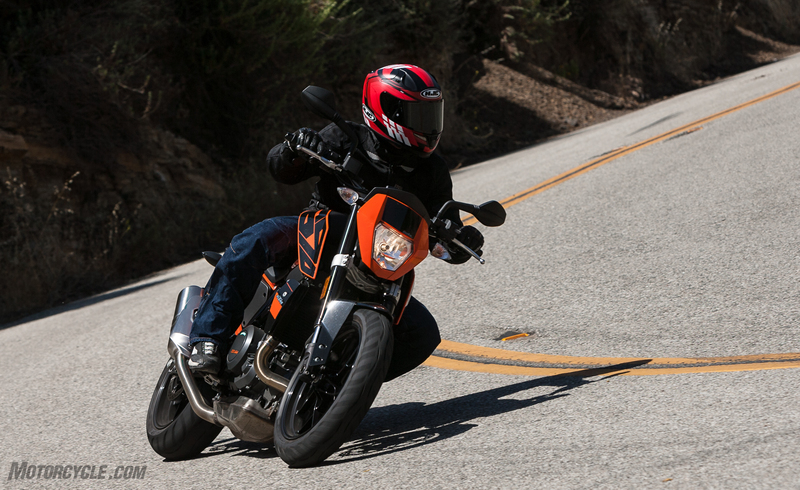 Then again, the KTM is the outlier in this test in many ways. 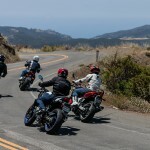 Besides the fact it’s significantly more expensive than the rest, you’re also sitting more upright than the others, almost in a supermoto-type position. 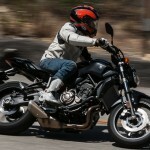 There are also mixed feelings for the Yamaha. 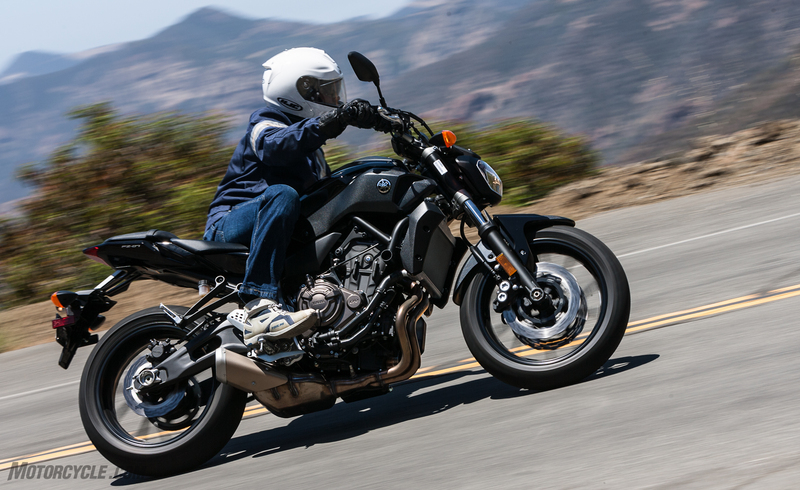 Weighing in at 397 lbs full of gas, its sub-400 weight is hugely impressive. 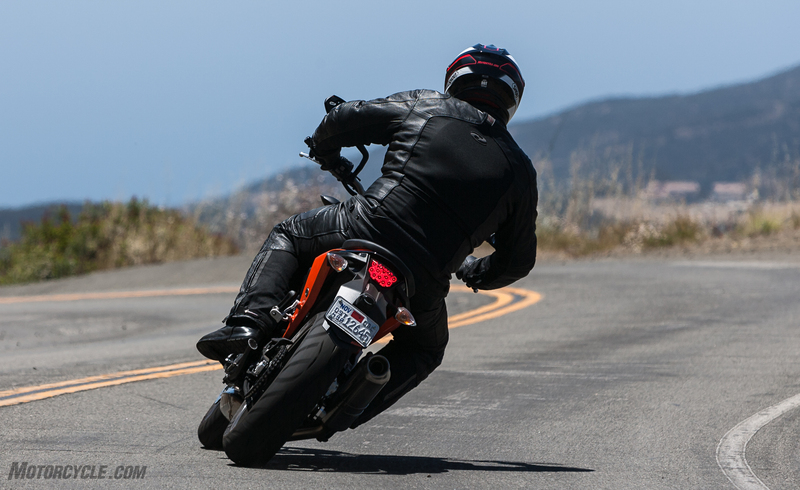 It shows in the twisties, as the FZ-07 feels nearly as easy to toss and turn as the KTM. 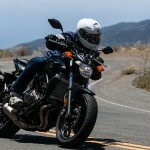 After hopping off the SVs (especially the new one) and onto the Yamaha, I jotted in my notes how the difference in weight during transitions is especially pronounced when riding them back-to-back. 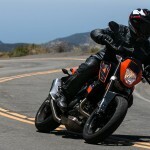 The KTM might be the most supermoto-esque of the bunch, but the new SV650 isn’t so bad at backing it in, either. 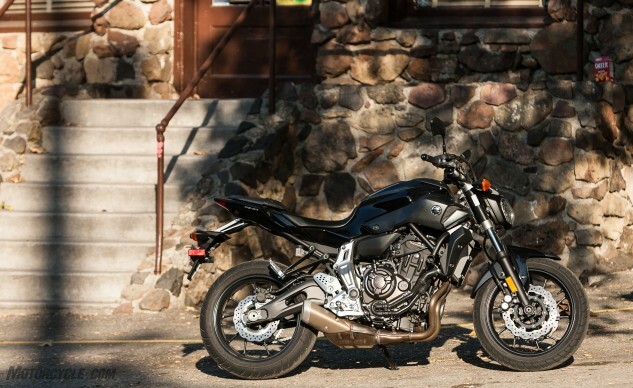 At 397 lbs soaking wet, the Yamaha FZ-07 changes direction nearly as quickly as the KTM, but its chassis loses some composure on rough roads. 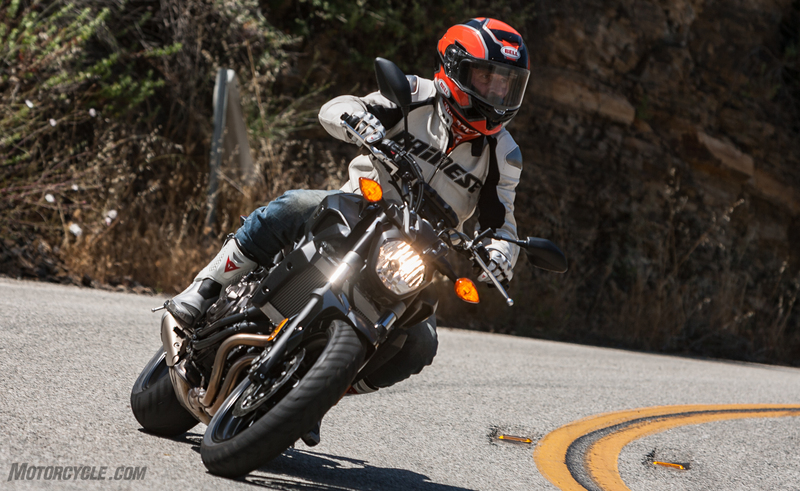 Despite the suspension complaints, the FZ-07 was top pick on JB’s scorecard for handling, and was tied with the KTM on Gabe’s scorecard. 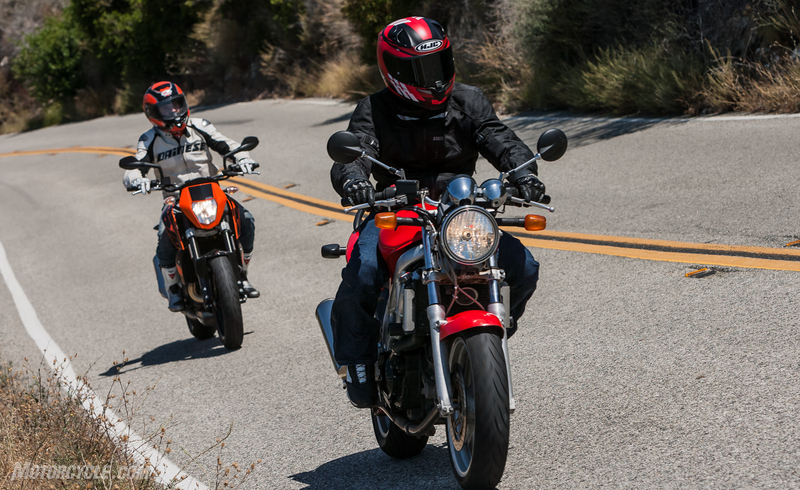 As for the two SV650s, things get a little interesting. 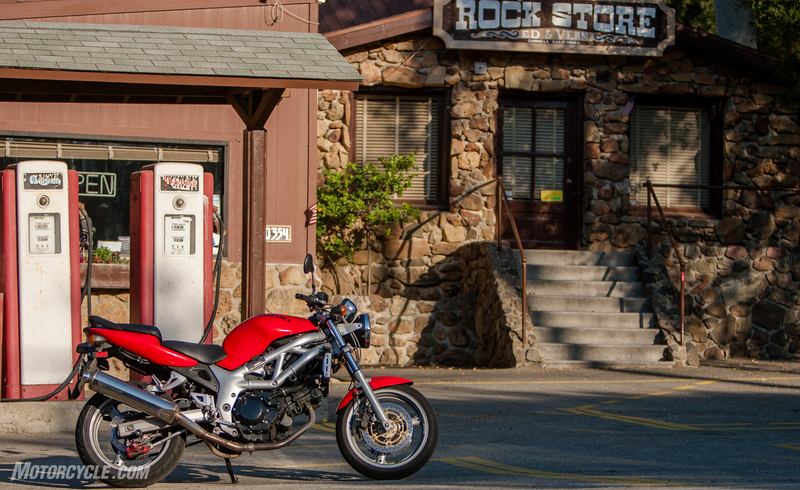 It isn’t entirely an apples-to-apples comparison between the two, as Gabe’s 1999 SV has heavier fork springs, thicker oil, and 20,000-plus miles (oh, and a ZX-6R rear shock). 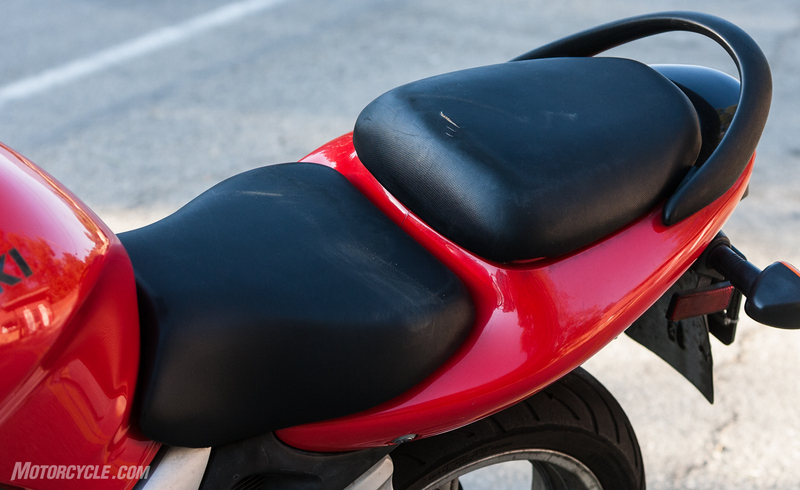 However, the character from the chassis between new and old, aluminum frame versus steel frame, is so similar. 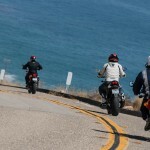 Both change direction in one fluid motion, and both give the rider great connection to the road. 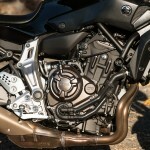 The new SV has the opposite issues the Yamaha does. 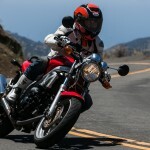 It’s heavy, and it feels so from the saddle (when judged against the others), but once leaned over it’s hard to upset it. That’s a statement both Sean and I agree with. 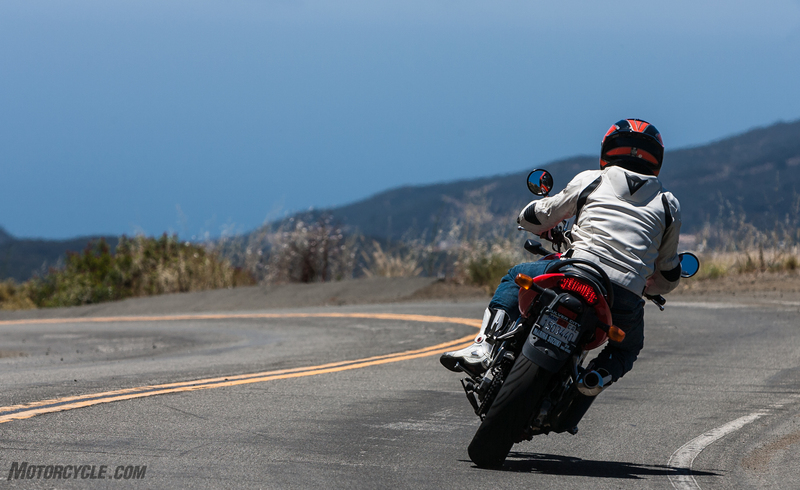 Sean’s a fan of the chassis geometry, ranking the SV his favorite handling machine on the scorecard, and I liked how stable it felt leaned over. Call it the road-hugging weight compared to the others, but the new SV feels relatively planted on its side, even if the road is far from perfect. 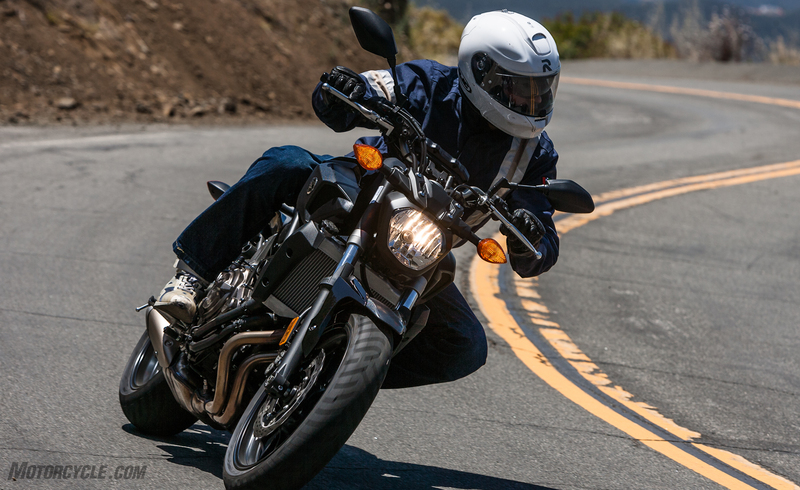 The Yamaha, while lighter and easier to flick, gets unsettled easily when you combine speed, lean angle, and a bump in the road. 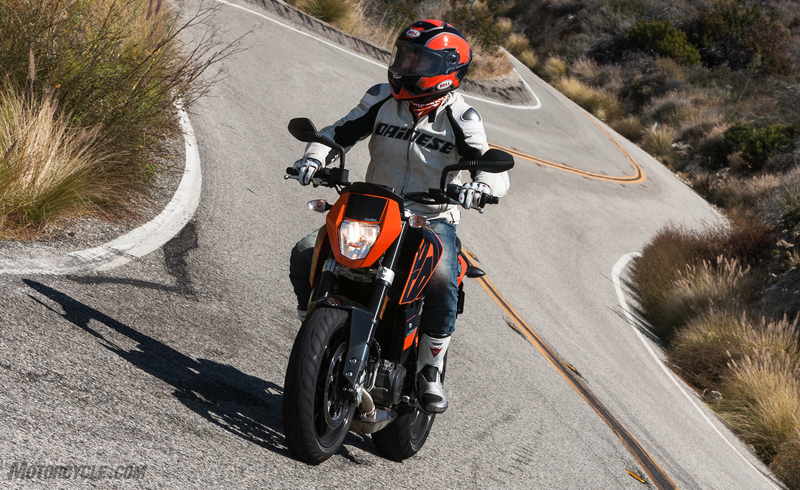 The 690 Duke was made to carve a twisty road. 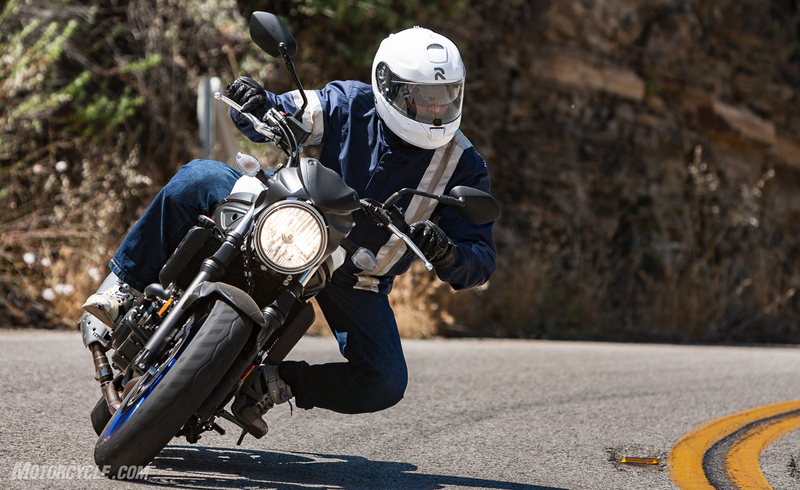 Its wide, MX-style bars make the 345-lb Duke feel like a toy underneath you. A little bit of instability is something John’s able to accept. 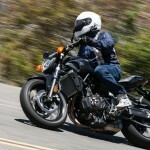 Burns, who’s never been much of an SV650 fan, calls the new SV old fashioned. 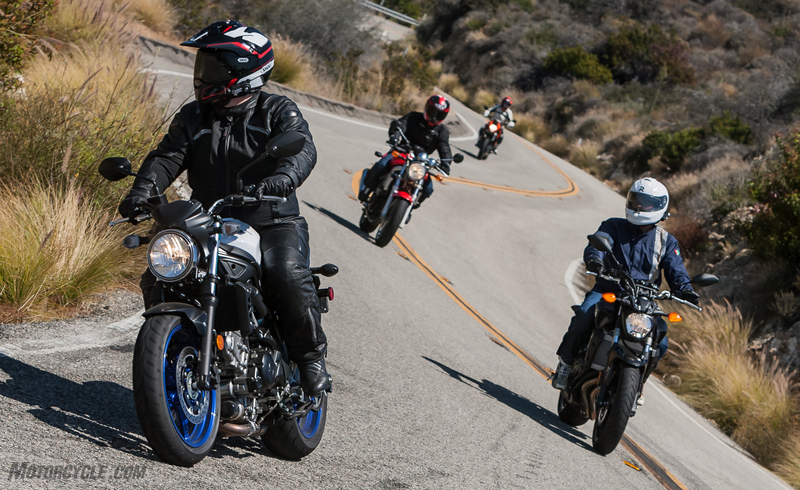 As fun as all four of these bikes are in the twisty stuff, all also make great motorcycles for general commuting duties. 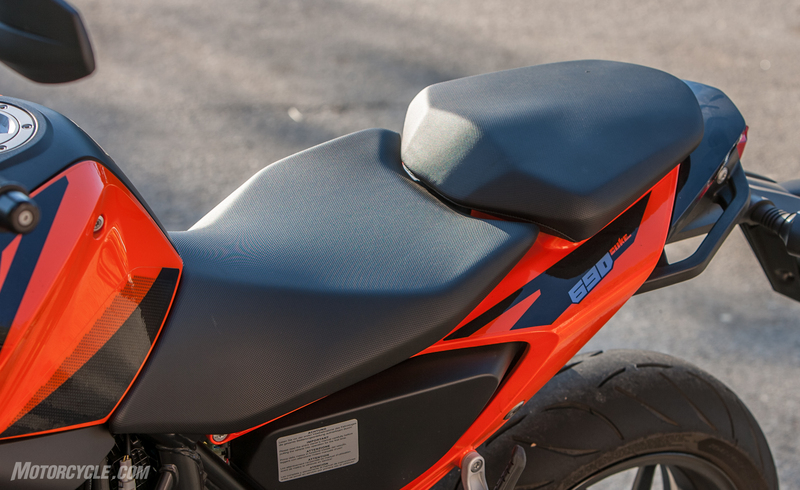 As noted in my Top 10 Features of the KTM 690 Duke story, the Austrian’s seat is very roomy, which is obviously great for larger riders. 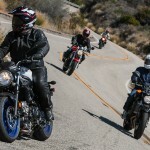 But it’s also nice for taller riders, too “as long as you can live with a big Single on the freeways,” notes Sean. To that end, the “big Single” really wasn’t much of an issue to the rest of the testers, its dual counterbalancers doing a great job to cancel out vibes. 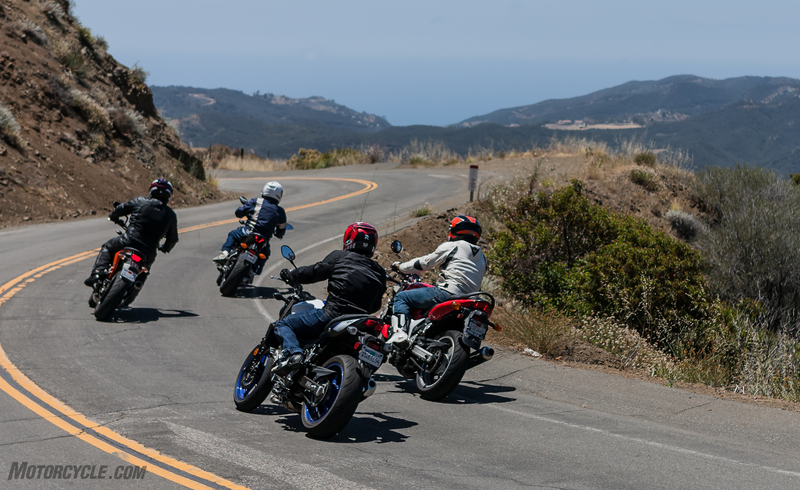 There is slightly more buzz than the others at 80 mph and above, but you’d have to be riding them all back-to-back to really notice it. 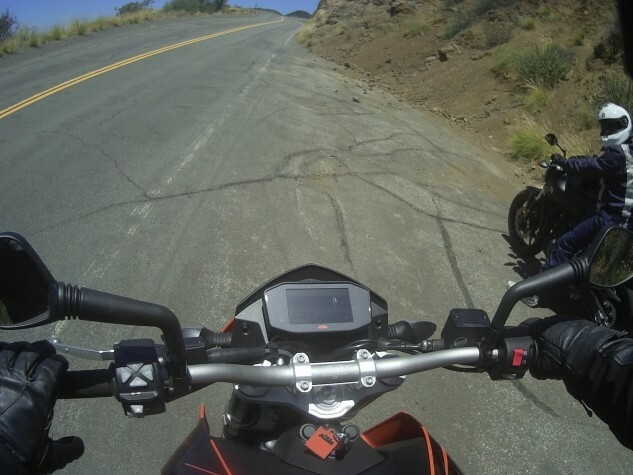 This screengrab from Sean’s helmet cam shows how hard the KTM’s TFT display is to see. 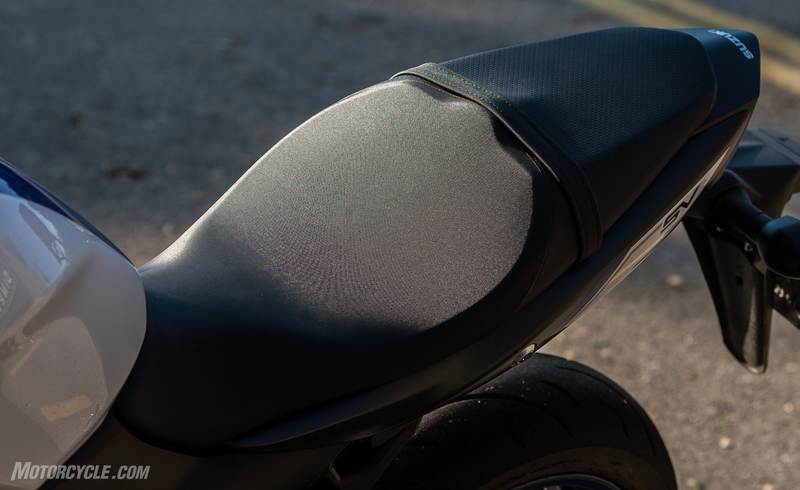 The display is pointed almost straight up and harsh sunlight blocks any view of the screen. 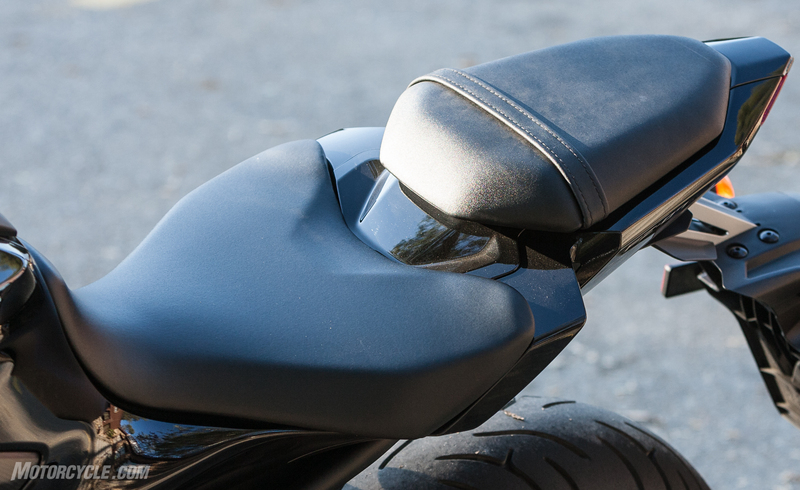 The bars place you more upright (though you can rotate them within the triple clamp if you prefer a slightly different position), and the pegs are relatively low, so the rider triangle is ideal for commuters. 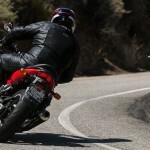 However, I found this position to work against me on the highway. 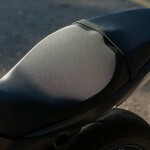 As there’s zero wind protection on the Duke, my chest became a sail while traveling 80 mph on the freeway. 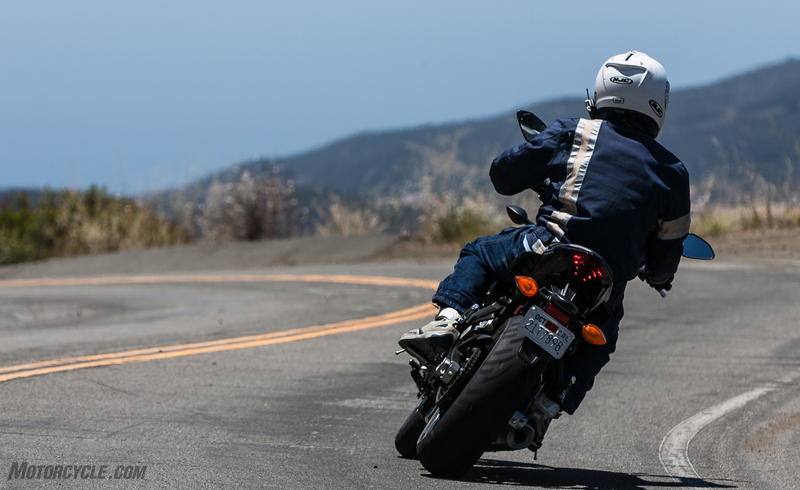 The others at least point the rider in a slightly forward bend, making it less tiring to fight the wind blast. 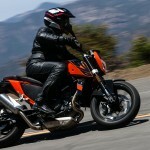 The new SV has the rider reach the furthest of all to grab the controls. 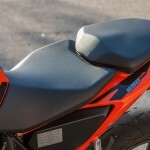 In Suzuki’s quest to make the SV as narrow as possible, the fuel tank follows the contours of the frame. 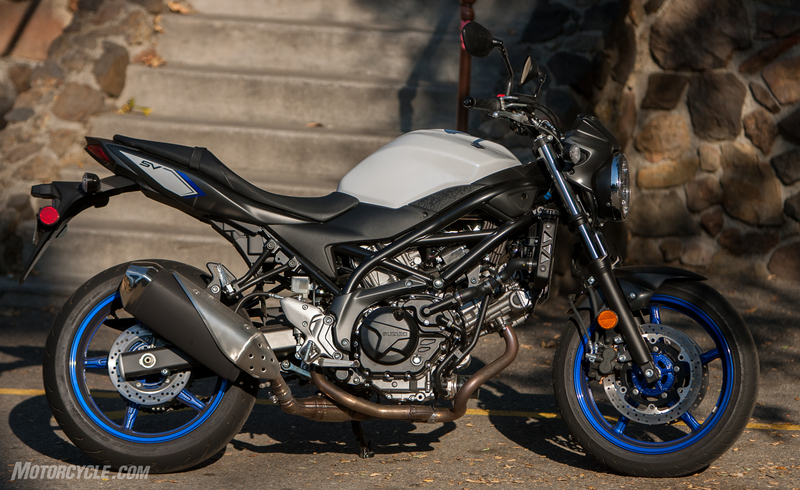 This narrow appearance is visually appealing, but Suzuki also fitted the SV with narrow bars. The combination of long reach and narrow bars doesn’t do the riders any favors when it comes to hustling the bike around. But if you’ve got a long torso and/or longer arms, this may be less of a concern. 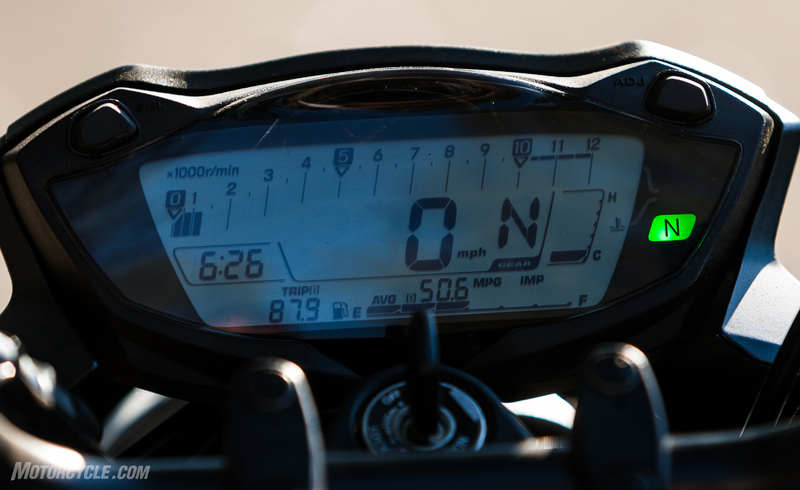 Another screengrab from Sean’s helmet cam shows the proximity of the FZ-07’s gauge cluster is to the rider. 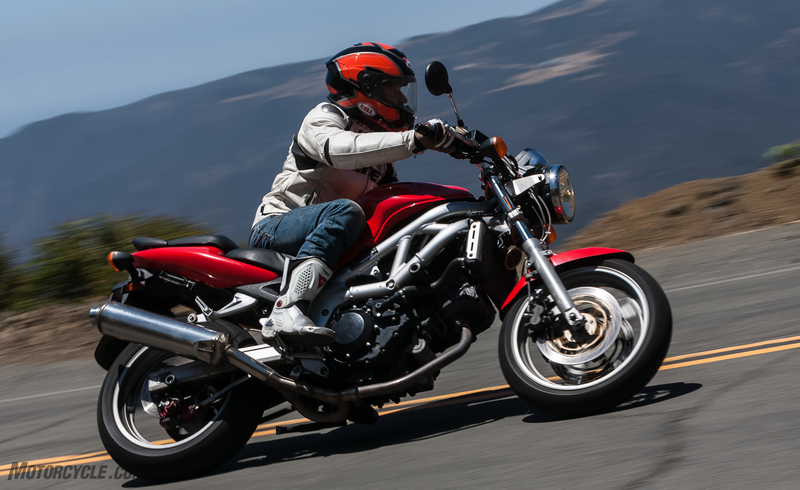 Contrast that with the SV pic below. 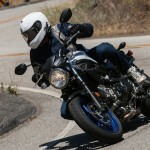 Yamaha’s FZ-07 falls somewhere in between. The seating arrangement is compact in relation to the others, but that’s not necessarily a bad thing unless you’re big or tall. Only Sean fits that category among us. 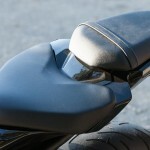 Gabe thinks Yamaha “made the seat too low and the pegs too high. 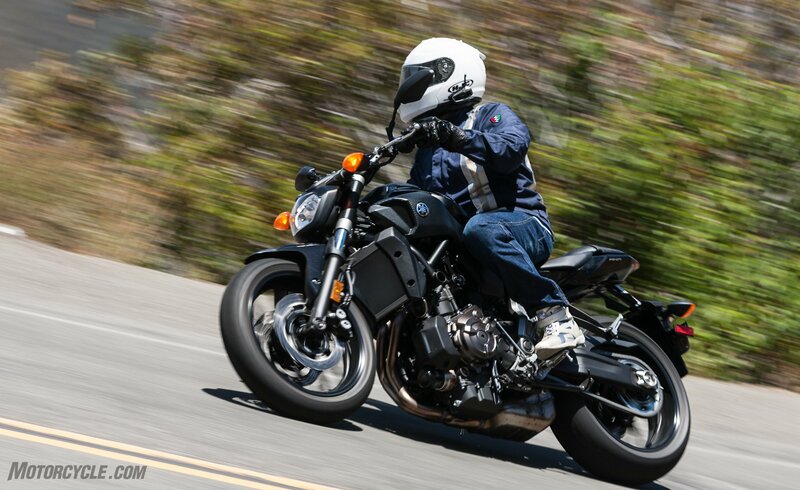 When you’re sitting on it, it looks like somebody hacked off the front with a Sawz-all.” I didn’t mind it, and in fact Burns rated the FZ highest on his scorecard in the Ergo/Comfort category. 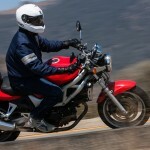 I had the FZ and the 1999 SV tied as my favorite. 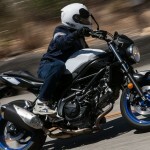 I liked the compact feel of the Yamaha, especially in the twisty stuff, but also didn’t mind it on the freeway, either. 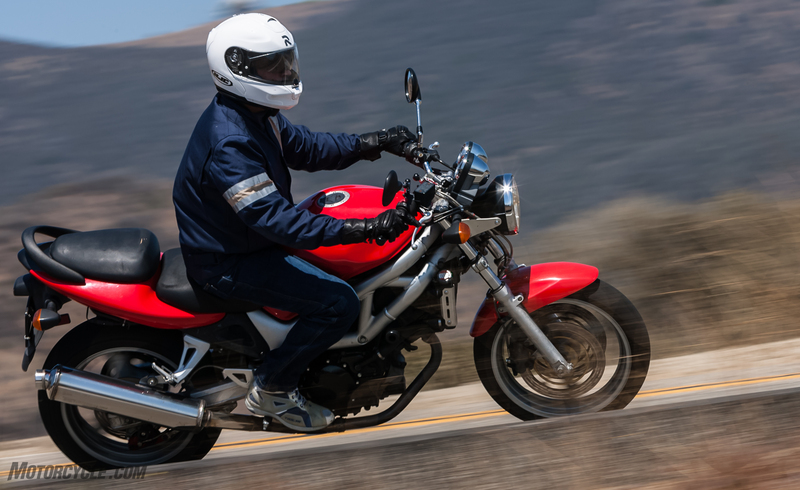 When it comes to piling on the miles though, the Goldilocks of the group, in my eyes, was the first gen SV. 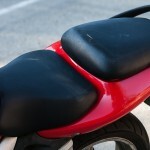 The reason is simple: the seat on Old Red had the most padding of any of the bikes here, by far. It’s like sitting on a pillow compared to sitting on planks for the others. 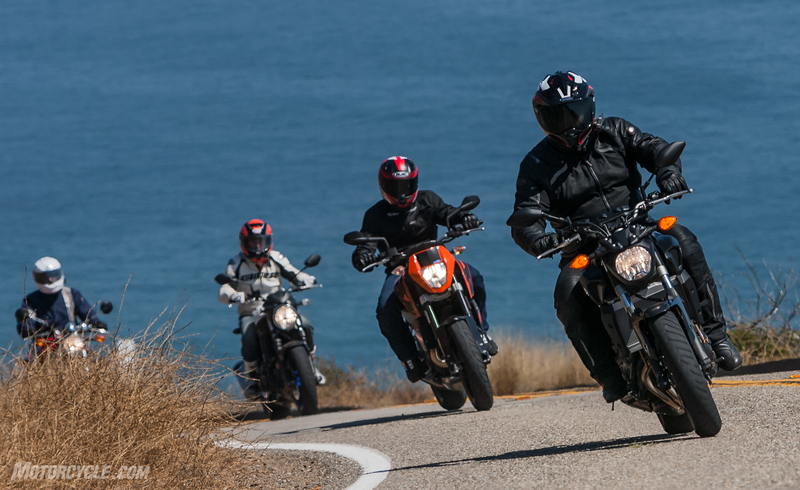 Ultimately, the KTM got the highest overall score in the Ergo category, but these four testers are split as to their outright favorite. 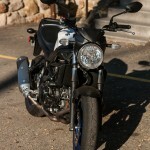 Here’s the SV650 cockpit. 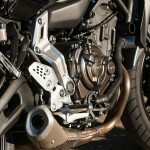 Bars and gauges are clearly further away and easier to read than the Yamaha. 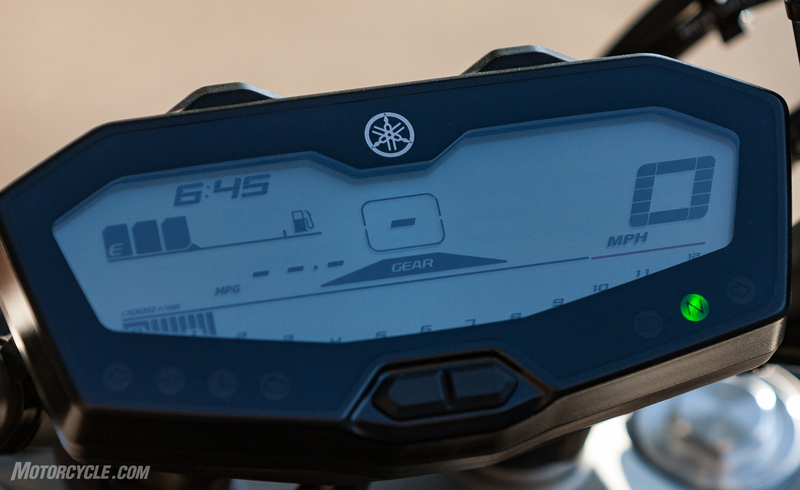 All three modern bikes here have some sort of electronic dash display, including a gear-position indicator. 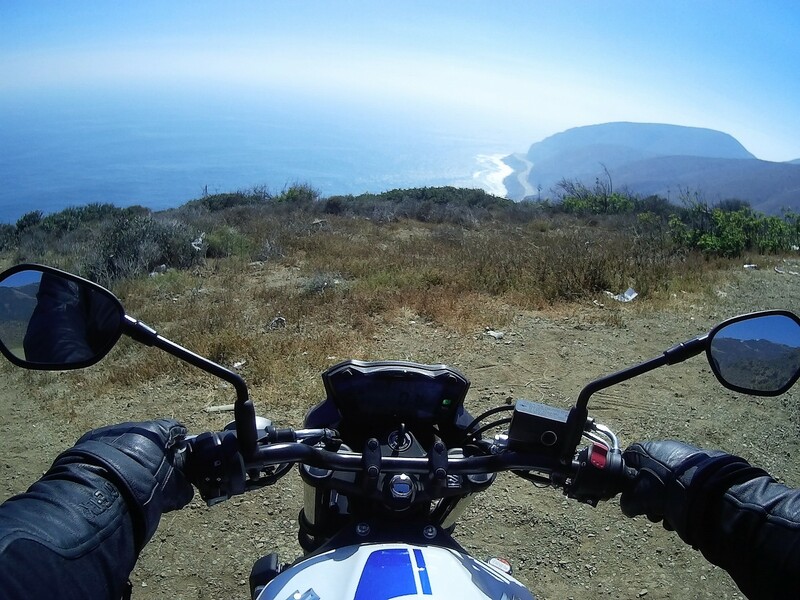 However, they were all hard to read at a glance, especially in the harsh daylight sun. 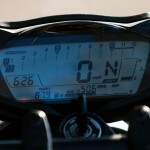 The KTM was particularly bad, as its beautiful TFT display is completely useless under the glare from the sun. 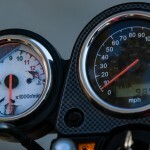 Despite the fact the numbers on the 1999 SV650’s analog tach were peeling off, I think we all renewed our appreciation for a simple needle to tell us how fast we’re going and how fast the engine is spinning. 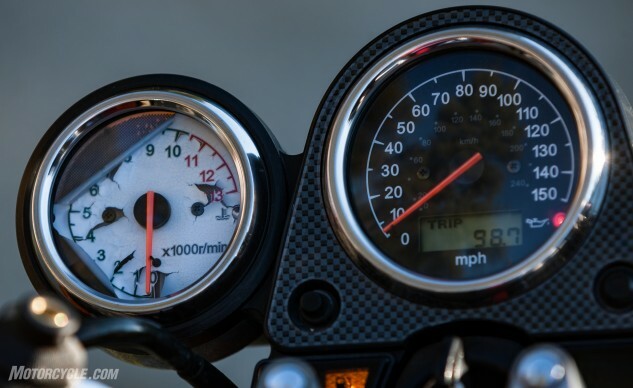 Despite the backing coming off from the 1999 SV650’s tach, there’s something special about the simplicity and functionality of a pair of analog gauges. By virtue of having the best specs in the braking department, the KTM with its 320mm disc and four-pot Brembo caliper easily won the this category of the scorecard. 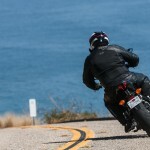 The huge brake and light weight of the bike meant stopping power was fierce. 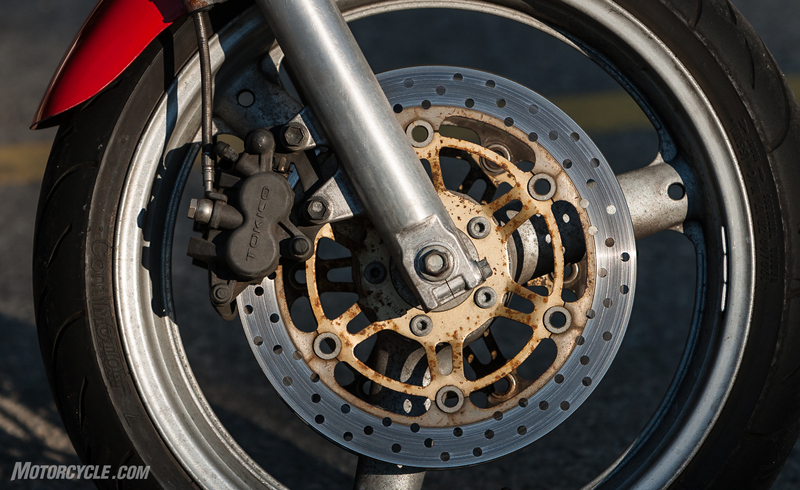 “Really great brakes,” said Gabe,”especially for a single disc. 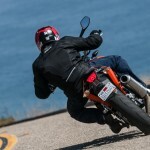 Nice bite and feel.” The KTM also benefits from being the only one with ABS. 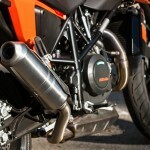 The KTM wins by default in the tech department. 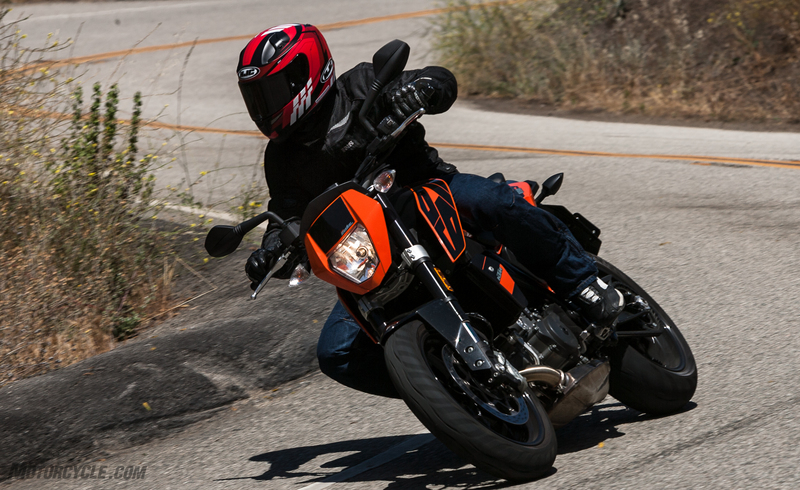 It being the only one with riding modes (not that you really need them), ABS, and traction control. 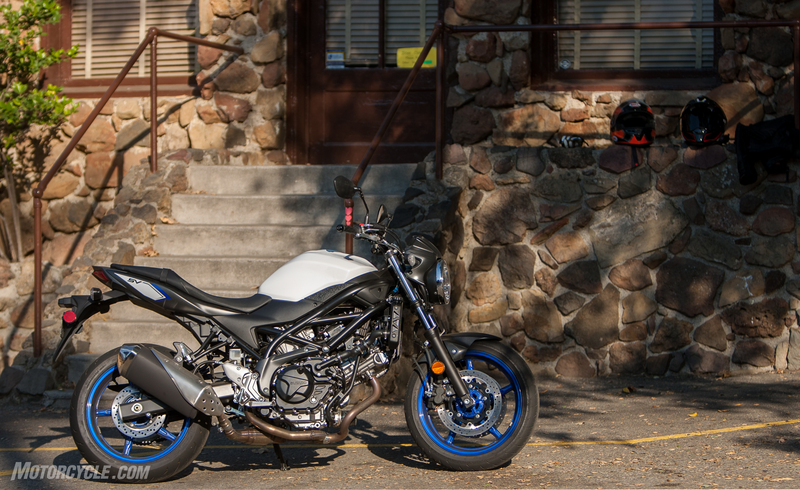 Despite finishing last on scores, the first-gen SV was a hoot to ride, and thanks to Gabe’s tastefully chosen mods, it could hang with the other bikes just fine. 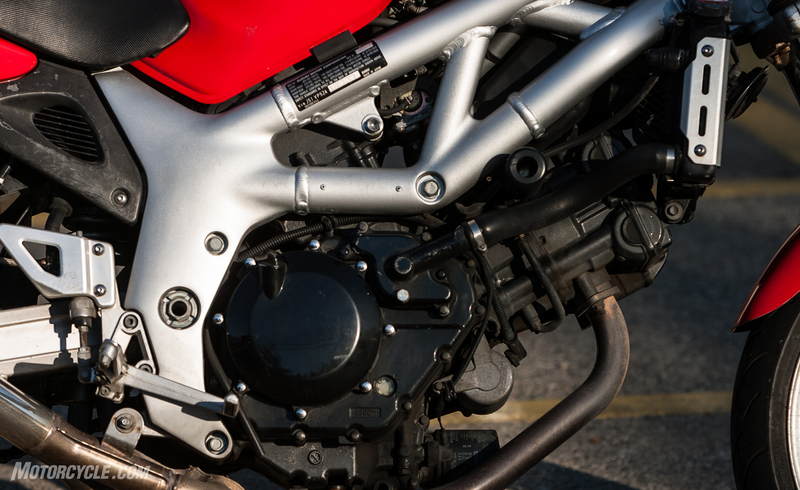 Seventeen years of wear and tear have taken their toll on the SV’s appearance, but isn’t patina in style these days? As these tests usually go, there can only be one winner. But this is a case where the Scorecard decision doesn’t truly reflect how each rider feels. 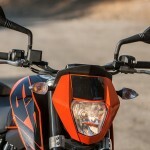 The KTM really took a blow in the objective section of the Scorecard because of its price, but clawed back a lot of ground by having the least weight and best power-to-weight ratio. 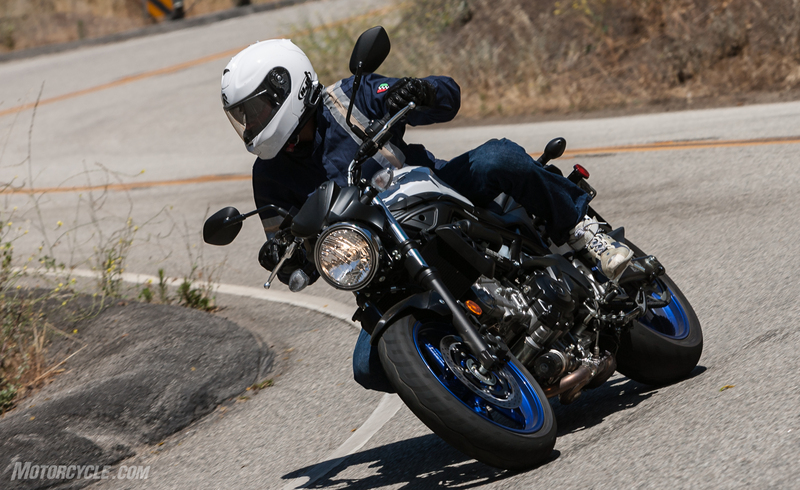 And there were some categories where we clearly had to give it the best score, like brakes, tech and suspension. 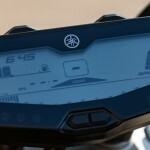 In fact, the KTM finished first or second in nearly every category of the Scorecard except one – it finished a distant last place in the Instrument category for the terrible positioning of the TFT instruments display. 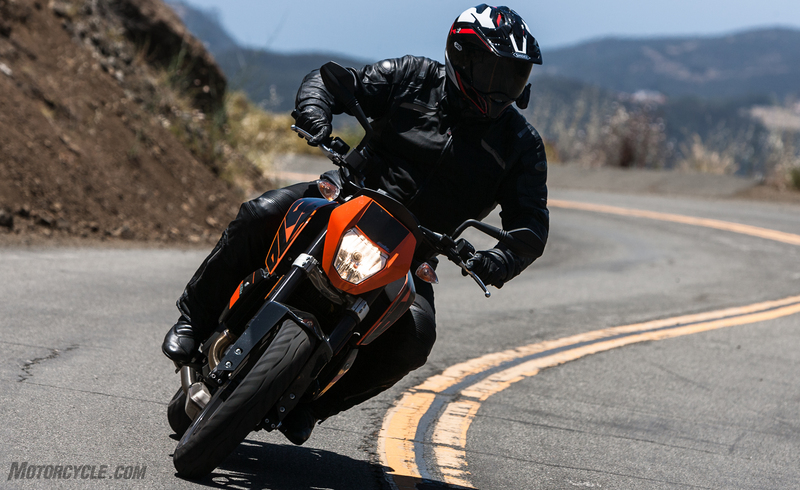 Ultimately, with an 84.2% score, the KTM 690 Duke is the winner of this test. In reality, however, of the four, only Gabe’s scores align with this conclusion. 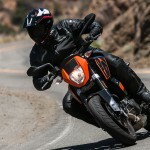 Objectively, the KTM 690 Duke is superior in many ways to the other bikes here. 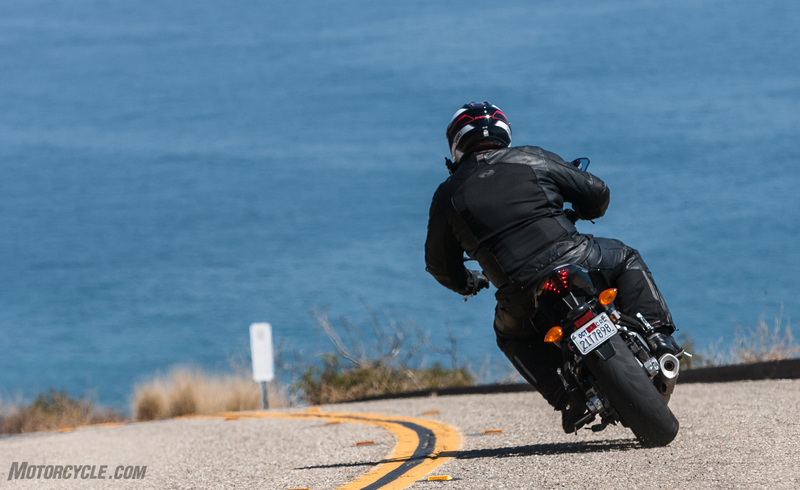 Less weight, great agility, and more tech help offset the higher price tag. 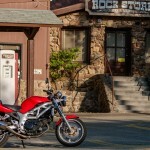 It’s clearly a very good motorcycle, but our eclectic tastes resulted in a split decision. 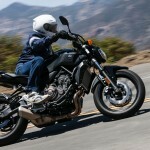 The Yamaha, however, came a very close second, 0.36 percentage points adrift. 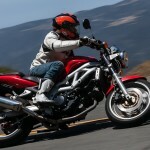 Sean, sticking steadfast to his SV devotion, is listening to his heart. 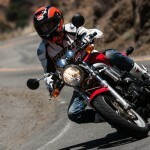 Despite objections from his brain, which ranked the Yamaha number one. 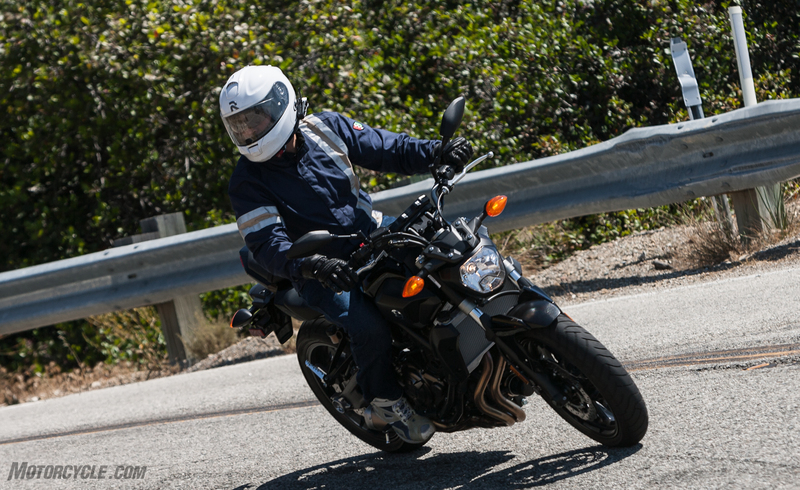 John, meanwhile, took this opportunity to smack talk the rest of the SV-loving fanboys and pledge his allegiance to the FZ-07. 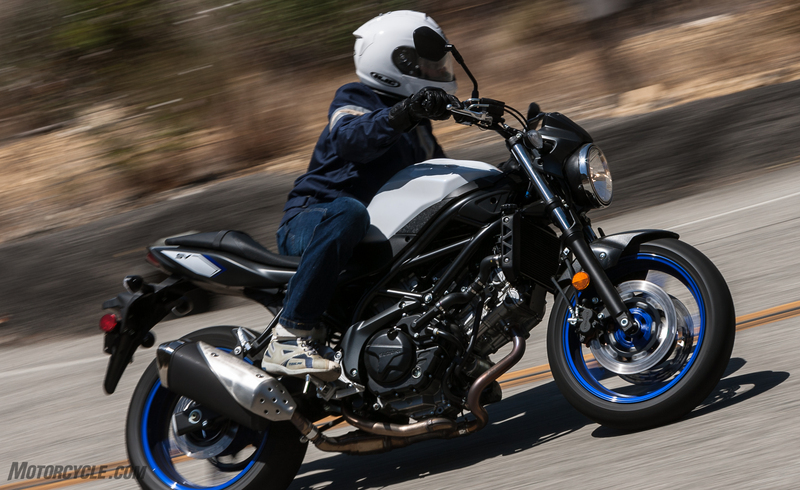 Try as Suzuki might, the new SV650 comes up short to the Yamaha FZ-07. 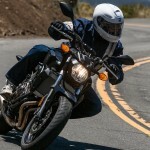 While not a perfect motorcycle, the Yamaha’s engine delivers strong bottom-end and midrange power. 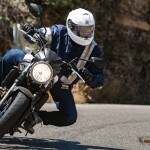 Its handling woes can likely be solved with a few choice upgrades from the aftermarket, and the relatively tight ergos are really only a problem if you’re big and tall. As for me, it looks like I need to eat a slice of humble pie. After gushing about the SV after coming back from its intro, this test proved to me that the Yamaha FZ-07 is the superior machine – though the KTM is a really close second. 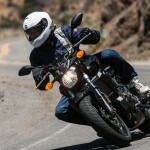 There really is no replacement for displacement, and the SV is unfortunately outpaced here. Its heft doesn’t do it any favors, either. 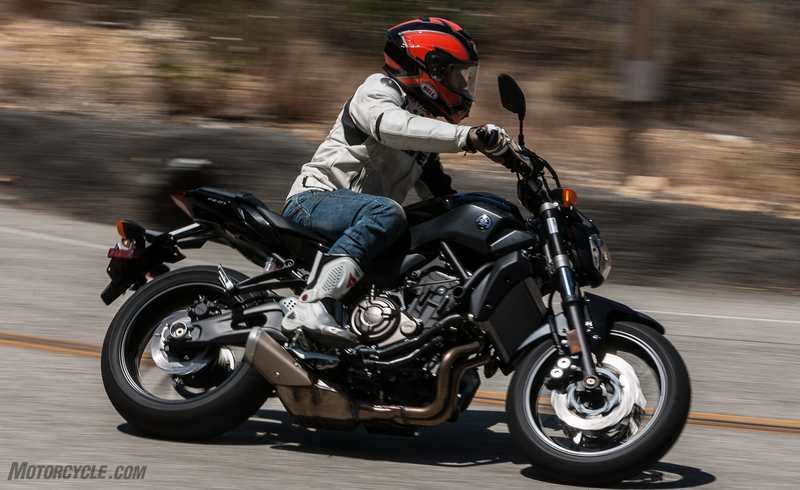 In my first ride review I mentioned how the new SV has captured the magic of the original. I still stand by that. 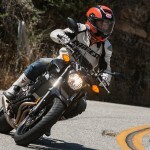 The problem is motorcycles like the FZ-07 and 690 Duke are simply better. 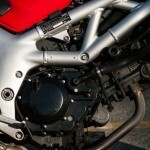 Rear Suspension Link-type single shock, preload adjustable. 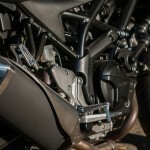 Single, preload-adjustable shock; 5.1-in travel WP shock absorber with Pro-Lever linkage; 5.3-in travel Link-type single shock, preload adjustable. 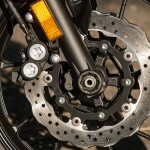 Front Brake Dual 290mm floating discs, two-piston calipers. 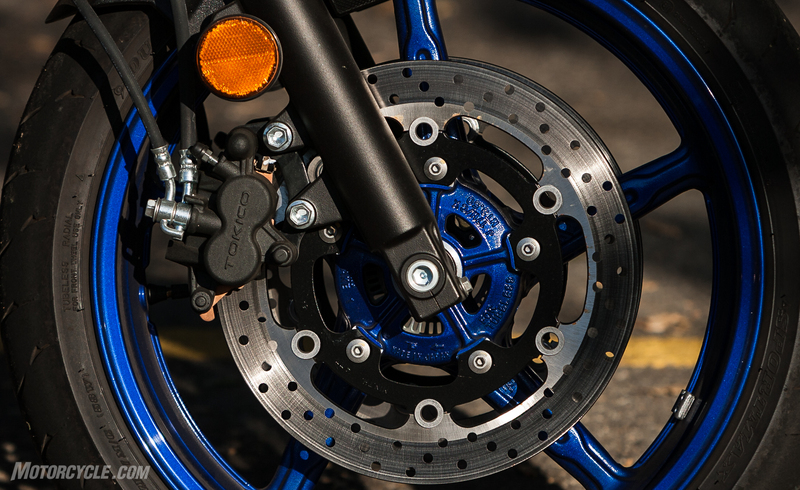 ABS Dual 282mm discs, 4-piston calipers Single 320mm floating disc, Brembo four-piston caliper. 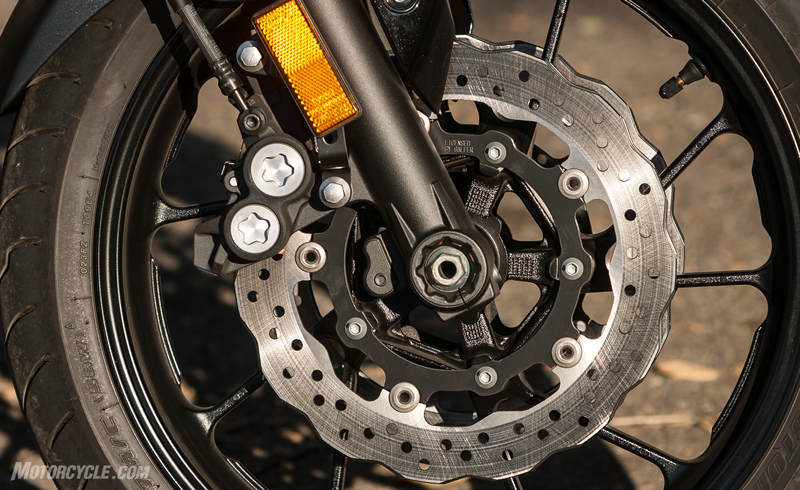 Dual 290mm floating discs, two-piston calipers. 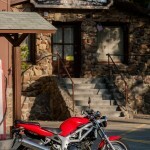 Fuel Capacity 3.8 gal (3.6 gal CA) 3.7 gal 3.7 gal 4.2 gal.